And for me, my first impression is... "Yes, please." While I so dearly want to criticize the story step by step, I'd rather knock a single star off and get over it. Why? Because the artwork, animation styles, voice acting, and singing in this sequel have promised that they will keep me entertained. So entertained, in fact, that I really don't care that the writers seem to be self-medicating at this point. Show By Rock!! is by far, My favorite anime I have watched, The music is so wonderful, the animation is so adorable and the characters are so relatable and hilarious, Though it does move a little fast paced in episode one, But besides that its wonderful! ShinganCrimsonZ gives me light all the time, Its a shame Crunchyroll doesn't have season one, But atleast we can all enjoy season two, and how they started season two was kinda emotional which got me addicted, The anime hooks the watchers in and it makes everyone happy watching it, I have showed this anime to atleast 20 people, and 18/20 people enjoyed it and recommended it, The other two only disliked it because of the main character, Cyan. She is too clutsy of a character and she often confuses any first-time watchers. Plus one person in general can't stutter that much. But overall, This anime should earn a Grammy! and To anyone reading this and haven't watched the anime, You are missing out, Stop reading this review and get watching! looks cute, to bad i can't watch it! where can i possibly watch anything at all that is not strictly mainstream at the moment??? am i just forced to sit over here in Sweden and just wait? or do they want me to pirate things like this? So when I started watching I kinda sighed. Oh, another school girl turned magical. This time, using the power of music!....it was not. And boy, was I happy. I waited for the dreaded exposition. She's in school and got a crush and whatever else blah blah blah...thankfully, that never came up either. This is a good anime to watch without having to read too much into it. It's a guilty pleasure anime, and it's way better than Sailor Moon ever was. Cute show with a wide variety of animation styles. Some funny moments and seems to be a parody of the idol shows. Likable cast with a basically up beat format. Sometimes goes over the top in the angst department, but I have seen worse. Better than average and worth a try. 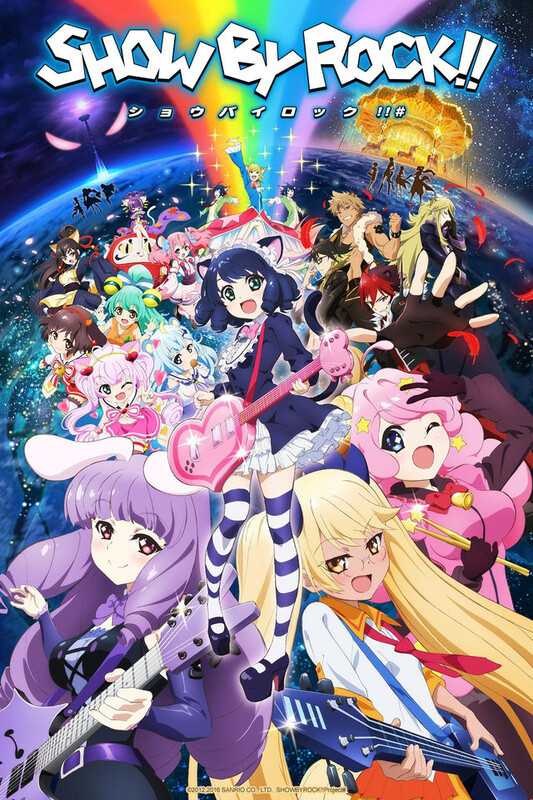 Originally released in Japan as a rhythm video game in 2013, Show By Rock became popular enough to turn into an anime. The story chronicles the story of Cyan, a first year high school student who has always wanted to join a band but has never been able to find the courage to actually join one. One night when she is in her room playing a video game, she gets teleported to a world called Sound Planet, a place where everything is about music. After defeating a dark monster by accident, she is persuaded into joining a band where she finds out about the darkness that haunts Midi City. The main thing that sets this anime apart from other musical anime is that it has more plot then just a band trying to win a competition. Because of this, Show By Rock is able to stand out and offer more to the audience. i like the furries. yes. title is a bit misleading. they broke free. they did that. WARNING: NOT SPOILER FRIENDLY IF YOU HAVE NOT SEEN SEASON 1!!! Oh boy. Where to begin. First off: I LOVE Show by Rock!! The anime made me play the rhythm game, which is what I am expecting to be: a GuitarFreaks inspired game with cute kemonomimi (and furries), and I have a weak spot for kemonomimi and furries. So its a win-win situation. First season was well for me due to the action-adventure build-up, while still keeping the cute girl (or cute boy) slice of life WITHOUT being a slice of life! (I am NOT a fan of that genre, but it has to pile with other genres in order to make it work!) Plus, I am a sucker for cute art, which I am shocked that Sanrio was behind on this IP. For the review, I am oping that its going to be the same "musical adventure" kind of anime again like in Season 1... And I got it, but there are a few differences this anime has. Story: Its not as original, but same time no Show by Rock(!!) story is original. But it has to flow fluidly in order to make teh story not very stressful. Season 1 nails it. Season 2 has at least two sub-plots, and these two are based on the mobile game's story for BUD VIRGIN LOGIC and ARCAREAFACT. The overal "core plot" for Victorious's threat is ratter "rushed" and is forgotten in these two sub-plots, making her like it was nothing. I enjoyed Dagger as a villain SO MUCH because he knows how to make himself threatening and menacing, and with the powers that can turn any Melodision into a monster. He only did this once, and that was debunked by Victorious, who has zero intention of turning any Myumon into monsters, and instead just want to turn Sound World into a boiled egg. I have a super hard time feeling sympathy for Victorious, even if her "flashback story" is revealed at the last minute. Some "tropes" are also being re-played in Season 2, and well... Its just as funny or fun in general as Season 1. Maybe if Studio Bones can come up with neat original tropes that are new to Show by Rock(!! ), then I would be alright? Characters: The strong FEATURES that made Show by Rock(!!) really eye-candy are the characters, both old and new faces! I love the "band cameos", which I got more than enough of Dolly Dolci, Gaugastrikes, Bangiba V (they need their own anime!!! ), and Studio Band Gyashuu (one of my non-anime faves b4 S2)! Top of that, the anime delivers two new bands to be a-part of the core story: BUD VIRGIN LOGIC and ARCAREAFACT. I am not to shocked that they are going to be the anime because I also play the game and they were revealed several months early to get a taste of their in-game music and stories (if anyone can read Japanese). I like both of the Season 2 exclusive bands, but I had a feeling that they deserve way more "importance" in the story. Season 2 just did not do enough justice to them, for me at least. Animation: Obviuosly from Studio Bones, the quality is just as same as Season 1. The 3D animation from Studio Gooneys is back as well, but I did notice a huge "screen time" difference in Season 2. The bands we know get at least one half-time of 3D, and then before or after of their performance, the animation shifts to 2D, non-Myumon 3D kind of performance. My only guess to why this was decided is that the audience intended for Season 2 are for those who have already season Season 1, and the anime itself is a mixed bag for newcomers. I get tired whenever everyone says they are turned off by the 3D animation. I love its 2D animation, but I appreciate Studio Gooney's 3D animation for being so close to "Pixar" level animation. There are no fur or texile textures, but the same time the 3D animation(s) seemed to work as a neat little promo demonstration for the franchise's slow rise on Myumon figures (which came true). Plus being a Sanrio project, I do expect for this anime to pick up the charm that made Sanrio's original vector-like designs pop and memorable. The End Preview animations were a nod to the "classic" 2D animations this franchise has back on the Sanrio YouTube channel, and the mobile game art. The other, meaningless bits: I am so damn happy Criticrista has a redeeming role and got a bit more spotlight than their Season 1 screen time. Dagger's pure evilness is what got me to love the cute girl band. Overall: A weak season, but its not that bad too. I am just happy that Season 2 happened because I love the franchise more than my 2011 self when I was into Puella Magi and PreCure. Furries, music and a bit of magic somehow win me over. The anime is NOT for everyone, and its understandable. Show by Rock(!!) is one of a few samples I want to re-watch again without stressing so much about the intense plot or drama like in my anime viewings I have seen in my past. I gave it a 4 out of 5 for "everything" this anime performs, but the only downfall is the rushed story pacing between at least three plots together. I really enjoyed the cute characters and interesting story. It has a varied set of characters. I absolutely love cat ears!! The music was great!! Different styles for different bands. I'd say it was a good mix. It has a few sad moments. Also I'd stay away from the second season.